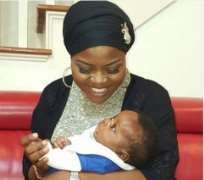 Bimbo Thomas shares rare photo with her cute baby to celebrate her new age. In the picture (below) posted online, the baby can be seen lying on her lap while she sat on a sofa with her eyes on her little angel. Here’s how she captioned the post as she celebrates her birthday today.